On being back in familiar surroundings…..
Everything still looks the same. Talked to some of the trainers (Los Angeles Kings) this morning. It‘s nice to talk to some guys I haven’t seen in a while. It’s nice to be back. 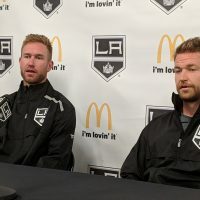 Despite being 2 ½ years since the trade is it tough to play against the Kings? Not really, it’s fine. Different conference. Last year we only played east teams with the way the schedule was. It will be a great time playing again at Staples Center. Do you feel you have grown as a player? Definitely! I’ve said it before. 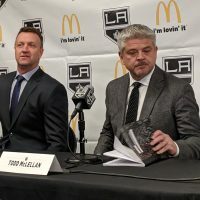 I was cast in a different role before (in LA) and the Flyers have given me an opportunity to play a different role and I have tried to run with it. On what he expects from the Kings….. The Kings are a big physical team, just like Anaheim. A lot of big bodies and goal scorers who can score on any given night. We just need to worry about ourselves and focus on what we have to do to win on Saturday afternoon. Have you had a chance to catch up with any of your former teammates? I will probably see some of the guys today, give them a ring and let them know I am in town. If not, I will just see them tomorrow. I’m a good buddy with a lot of guys on the team obviously. I don’t think that is ever going to change. I spent the first three years of my career hear. I love it in LA. It’s nice coming back for sure. 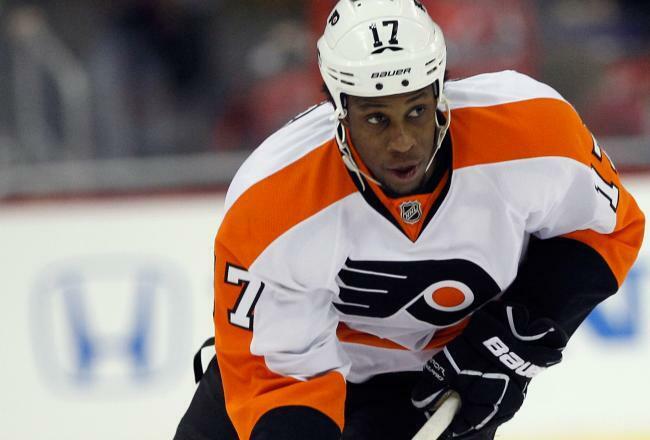 Were you surprised when you got the call that you had been traded to Philadelphia? It was actually a big surprise for me. I was at my uncle’s cottage in PEI when I got the phone call. I was shocked but hockey is a business and pieces get moved around you can’t be bitter. Philadelphia wanted me and I am happy to be a Philadelphia Flyer. They have given me the opportunity to grow as a player and I am thankful. Have you put together a list of “chirps” for your former roommate, Drew Doughty? I probably have the most ammunition on that guy than anyone else in the world. I will save it for the ice. I’ll say some things. We are pretty tight. We spend our summers just two hours away from each other. I probably see him every other weekend. I have a lot on that guy (Doughty). Have you stepped up in quality of roommates now that you are in Philadelphia? I actually live by myself now. I’ve grown up (teammate yells bullsh##$t) in the last few years. I’m on my own now. I think playing my first NHL game. 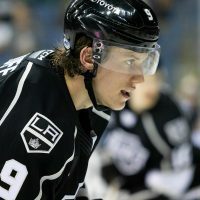 Putting on the Kings jersey, playing against San Jose. It was unbelievable. 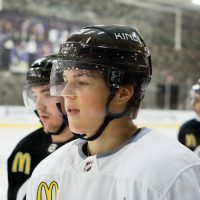 I am grateful to the Kings organization for allowing me to get my foot in the door. When you come to Cali no matter which team you play, you know you are in for a battle. It’s nice to see hockey grow here from the days when I first came to Los Angeles. Like I said, you come into anyone of these buildings and it is not going to be easy. Must be nice to get out of the frigid temperatures of the Northeast and get to some better weather in California? It’s pretty frigid in the Northeast. You come down here to California and the weather is nice. We are staying at the beach in Santa Monica. It was great waking up Friday morning and go for a walk on the boardwalk. That is something I definitely miss about playing in Los Angeles.